Manual planning is used to manually enter or change plan data. It is also used to visually analyze data, for example doing a plan/actual comparison. The amount of data used in manual planning should be limited – for working on mass data you should use planning functions (planning sequences). 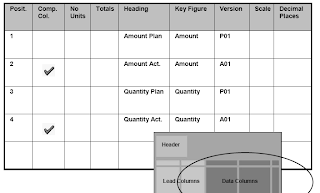 An input sheet in manual planning is called a planning layout and is always defined within a planning level. When you want to use manual planning and want to create planning layouts you first have to create the entry "Manual Planning" in the planning framework by using the context menu. 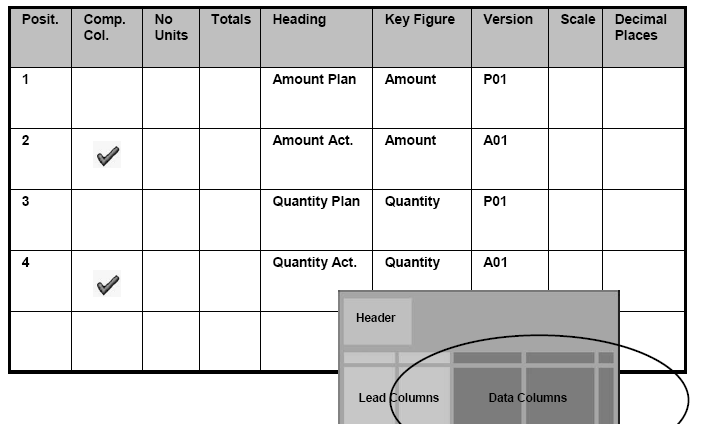 The planning level defines the level of aggregation of the data used in the planning layout. The selection of the data used in the layout is done by choosing a planning package. Thus the layout is a view on some data set defined by the planning level and the planning package. 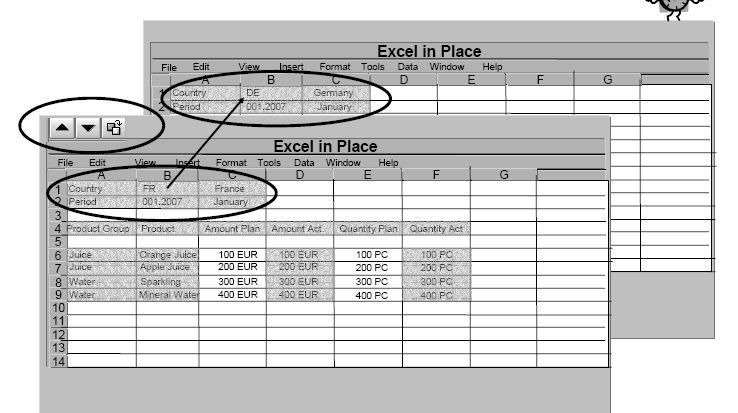 In the GUI you can use two different front end tool or grids for displaying layouts – Microsoft Excel or SAP ALV Grid. A layout is built in the layout builder. The layout builder is designed as a wizard containing three screens. The first two screens are used to design the front end independent settings, the third screen is used to set front end specific settings. You can move back and forth between the three screens.The principle ideas and general setup of a layout is quite similar to BEx queries in reporting. Header Area: The header area contains general selections that are the same for all cells/input fields in the layout. If – for example – within one layout you want to plan data for the next year only you can put the year in the header area. 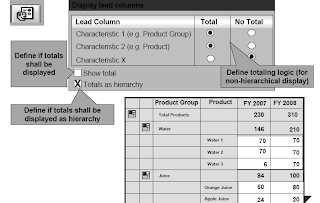 Key Columns (or lead columns): The key columns define what will be shown in the rows of the layout – if, for example, you place the characteristic product in the key columns then the system will show one line in the layout for each product. Data Columns: Here you define which columns you want to see in the layout. You can place different key figures in different columns (such as one column for sales volume and one column for revenue) as well as characteristics. If you want to see your revenue by period you can create one data column for each period all using the key figure revenue. In the first screen of the layout builder you determine where each characteristic is to be used by setting radio buttons. As every layout should be executable with every package only those characteristics can be used in the data columns that are not restricted in the planning package. The restriction can be seen in the above example – for product and product line you cannot choose the radio button for data column.The symbol to the right explains you that this restriction is because of the selection in the package. Later we will see that there are also other cases where such a restriction applies. When clicking on the symbol you will get more information.You can also set which type of text should be used in the layout for the characteristic values ("short", "medium", "long"). On the second screen of the layout builder you will see one tab strip for each of the areas in the layouts. The content of these tab strips depends on the settings on the first screen.For the header area you can choose the sort order in which the characteristics will be shown. If you do not want to see a characteristic at all you can hide it. 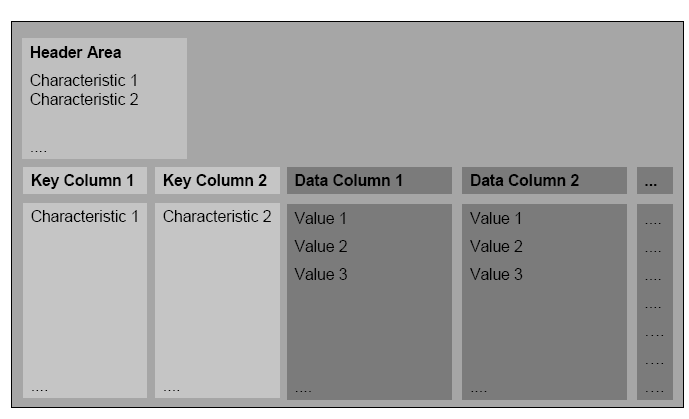 On the tab for the key columns you can specify the sort order of the columns and also how the characteristic value should be displayed. You can choose "Text", "Key", "Key/text" and "Text/key". Note that if you have chosen "Text" only (and not in combination with the technical key) you will not be able to add new lines in the layout. A text is not necessarily unique so the system cannot derive the technical key from the entered texts. Position: the sort order – this field can be used for easily rearranging the sort order of the data Columns. Comparison Column: This flag switches a column input off. In the above example we make the columns with the actual version input off. Note: all data selected in a layout will be locked, also such data that is contained in a comparison column. Thus this setting is only a local setting in the layout. For reference columns you can also choose characteristic values that are not in the planning level. No Units: If you do not want units/currencies to be displayed in the layout you can set this flag. Heading: Here you enter the actual heading for the data column. If you do not enter anything the system will automatically use the name of the key figure in the column as a heading. 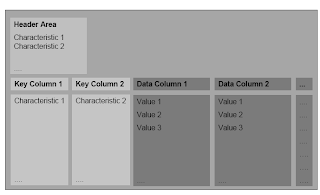 Characteristics: each characteristic that was placed in the data columns on the first screen of the layout builder will have one column in this table. In our example you specify which version is to be used in which column. Scale/Decimals: You can set a scaling factor as well as the number of decimals. If you do not set anything here the standard settings for the key figure will be used (maintain these settings in the BW Admin Workbench). 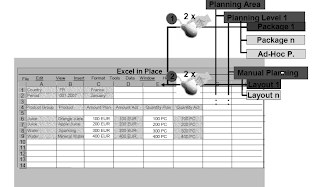 You execute the manual planning by double clicking on the planning package and the planning layout.The already existing data will be selected from the database (or the planning buffer if it is already contained in there) and will be displayed in the layout. You can now change the data or add new data. When planning with Excel the system will provided 20 empty lines to enter new records (if new records are possible). If you want to enter more than 20 new lines you have to press "check", "insert" or "save" (see next slide) and the system will provide with more empty lines.If you navigate away from the layout (by choosing another detail application) the data will be written to the buffer. If you press save in the SAP menu the data (and the customizing!) will be saved. As you have seen a characteristic in the header has exactly one value within a planning screen. What if in the selection you have more than one characteristic value? The system will access the database/buffer once with the entire selection (including all values for the characteristic in the header). Then it will determine what is the first header combination and will present it in the planning layout. You can move to the next/previous header combination using the arrow buttons in the menu or you can use the third button for going directly to a specific combination – even if it does not exist yet. Hint: Restrict the number of header combinations as all the data and not only the data you see when the layout comes up is selected from the database! When calling a layout with a selection that is not unique for the header combination the system will present the first header combination for which data could be found. If there is no such combination, i.e. if there is no data yet then the system prompts the user for the first header combination. 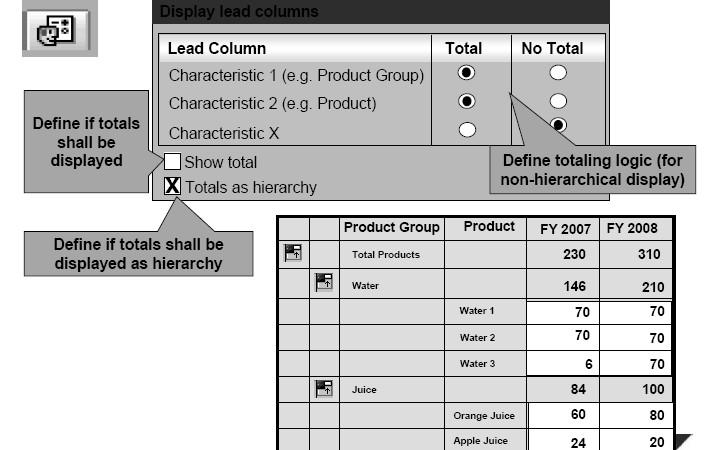 a hierarchical display for the subtotals.Note that the last option is only a display option and does not need or use a proper hierarchy. This feature is used to make a comparison between subtotals more easy as lines can be suppressed. The above popup is available in the layout builder as well as during execution of the manual planning. The settings you save in the layout builder will be used when starting the layout. The settings can be changed when executing the manual planning. Note that permanent changes can only be done in the layout builder.